Summer is officially over. Can you believe it? Fall is officially around the corner. 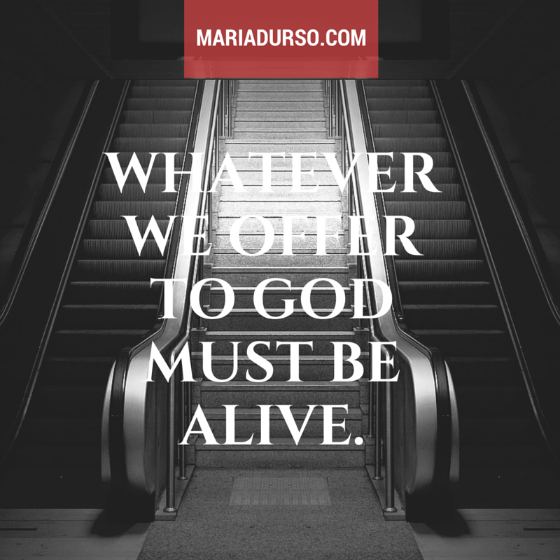 In this new season, I believe God wants to give us new life! For I am about to do something new. See, I have already begun! Do you not see it? I will make a pathway through the wilderness. I will create rivers in the dry wasteland (Isaiah 43:19, NLT). In order to receive this new life, whatever we offer to God must be alive. Dead sacrifices were not acceptable then, nor are they acceptable for us today. Romans 12:1 says we are living sacrifices, not dead ones. Don’t you see? We are the New Testament offerings God wants to consume! So the life we offer to God must be vibrant, full of passion—and the fire must not go out! You don’t “turn on” Sunday and then put the lights out on Monday! Our spiritual life is not to be put into a box. It shouldn’t be compartmentalized. We call Christianity a religion, but the Christian life really is not about the rules and regulations of a denomination. Every morning and evening—life! Our lives are supposed to be sending up an SOS to God continually, a fragrant aroma. Question: Are you alive? Do you need new life in this new season?